There's not much of tea-related import to say regarding (i), except getting Chinese tea in a Chinese university is like pulling teeth - they all drink Lipton teabags (!). 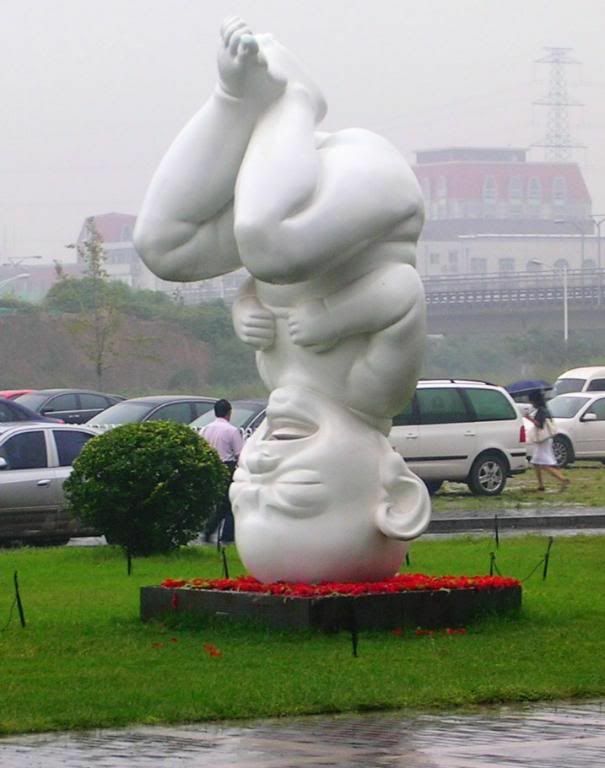 The photograph shown is a charming statue outside the arts faculty. 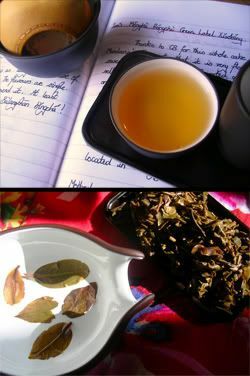 (ii) is a little more interesting, with a few finds of minor interest, and lots more bland tea encountered. 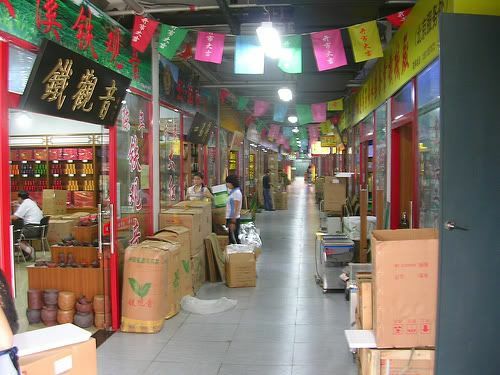 I've been popping into Xiaomei's shop on my way past each time, and it reminds me a little of "Cheers". 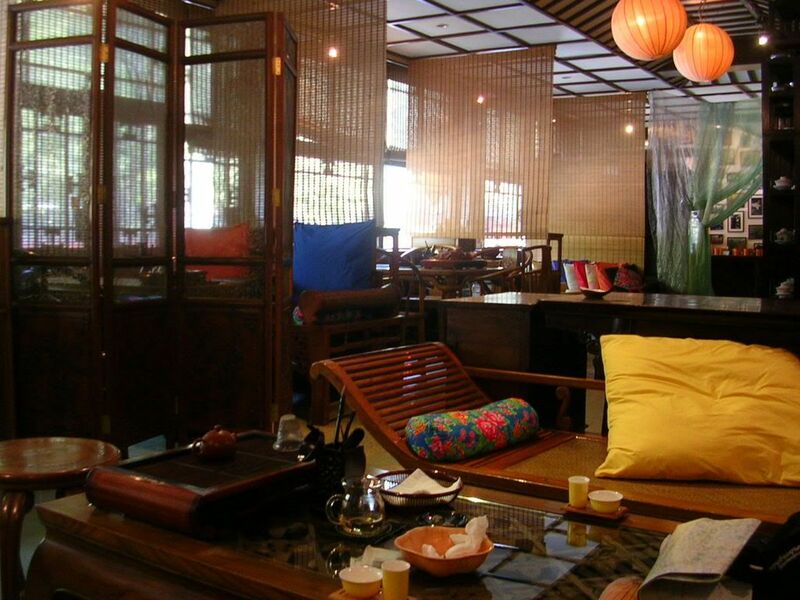 If you translated the Boston bar into a Beijing teahouse, changed the waiters for tea-vendors, and swapped Dr. Frasier Crane for a lecturer in Buddhist studies, you'd have Xiaomei's shop! It's a great place, and I've found a few things of interest in there. 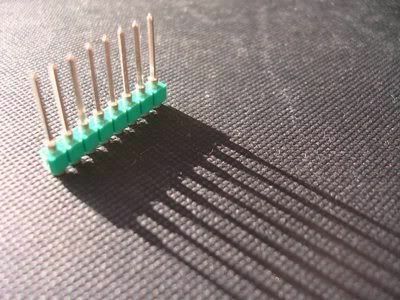 (iii) is fairly self-explanatory, though it can be a little depressing to be playing the elegant game with people who are trying to find ways to write computer programs to "break" it, in the same way that Western chess has been broken. Business and pleasure do not mix! 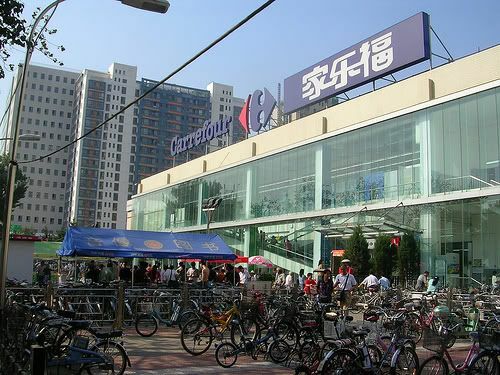 Over the last few days, I've been pushing into Chayuan, the sprawling mega-market at the far end of Maliandao - sometimes with my colleague, Blake [pictured]. 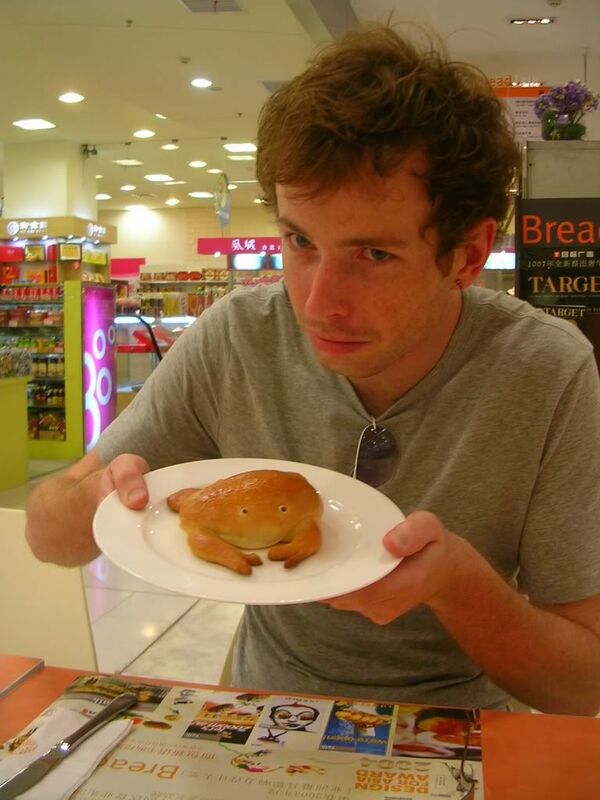 Blake likes crabs made out of bread and stuffed with custard. Though my bargaining has been improving with experience, I am happy to recount the following tale, which left both Blake and I doubled up in laughter in front of an equally amused shopkeeper. My level in Chinese is totally awesome. Me: how much is this small tray? Me: That's a bit high. How about 150? Pushing on, I realised that I hadn't taken the obligatory photo of... Luyu, is it? From previous pictures, I thought that this was a monumental piece of statuework, perhaps in a position of great prominence. In fact, it's hidden behind a bin off to one side and is approximately 1.5m tall - I had to crouch to make it look dramatic. ML, the pleasant chap who sold me the tuocha that I mentioned before, started off one of our trips, introducing Blake to some of his back-catalogue. 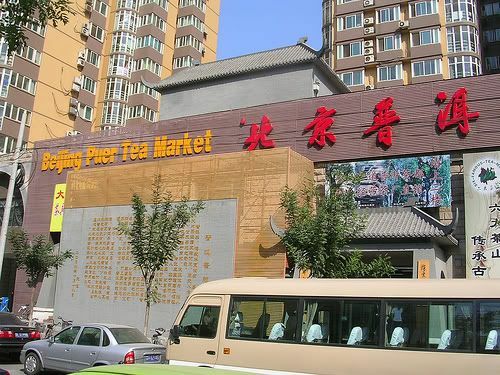 I grabbed some more tuocha, as did Blake, before getting a recommendation from him as to his favourite pu'er shop. 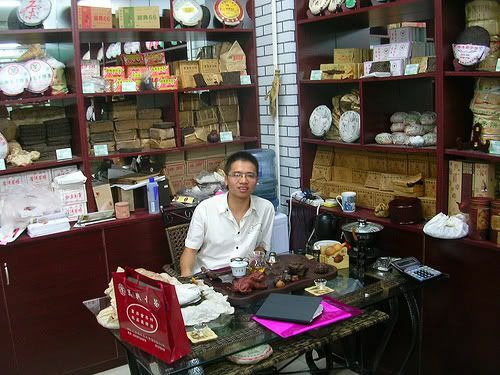 He came up with Yu Ling Yi, a place at the back of Chayuan that allegedly sells proper gushu [ancient tree] pu'er. It turns out that the place is "101 Lincang Factory", with organic blurb all over the shop, and large maps and promo-boards that make it look hyper-modern and progressive. 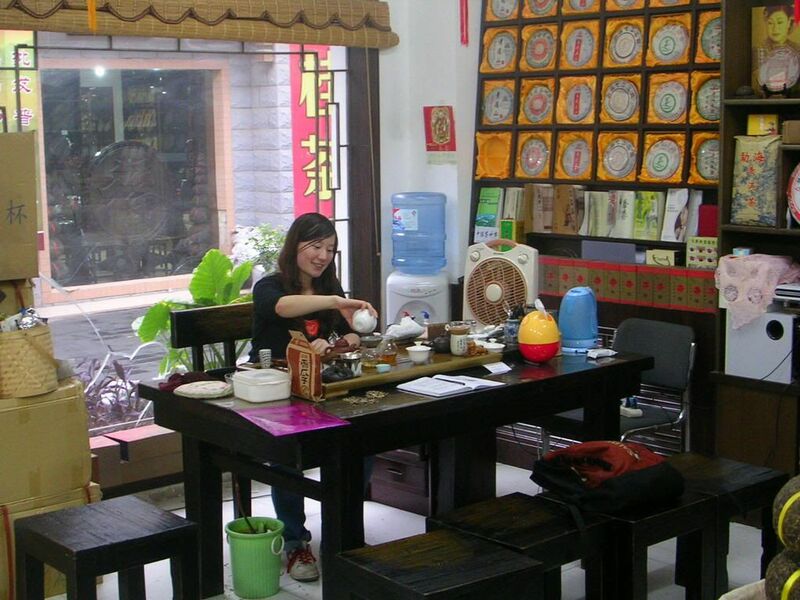 We were served by a young lady named Xiuxiu, whom ML had introduced to us by telephone from his shop. 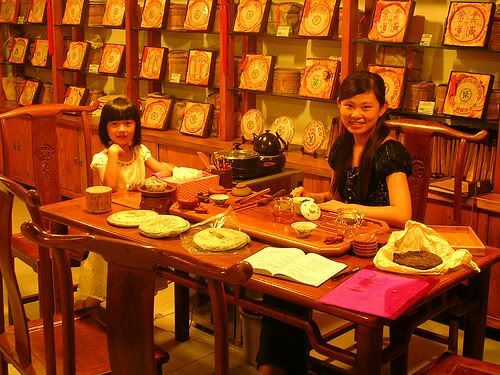 Asking for her favourite, we were served up a 2005 Jingmaishan [pictured]. The price is super-high at 600 RMB [$80]. 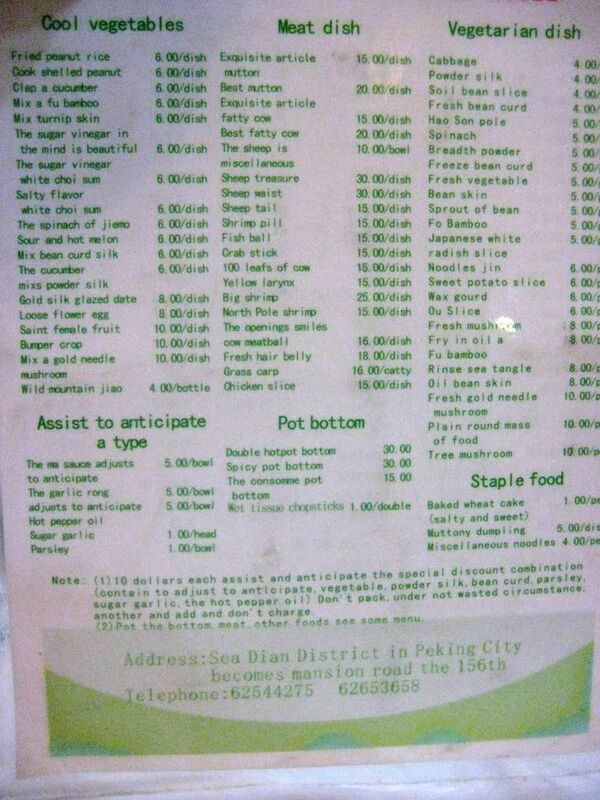 There's not much more expensive in Maliandao that I've come across for a young tea. It tasted mighty fine, and was clearly worth the accolade - but I'm not sure if it's worth the money. Or rather, I'm not comfortable with spending that amount of money when there are cheaper teas of slightly lower quality available - one of those tricky situations. As MarshalN pointed out, the photo is a bit dark and doesn't really show the true brightness - I think that's a bit beyond me, given the Chinese Windows XP thing here. She could speak less English than I could Chinese (! 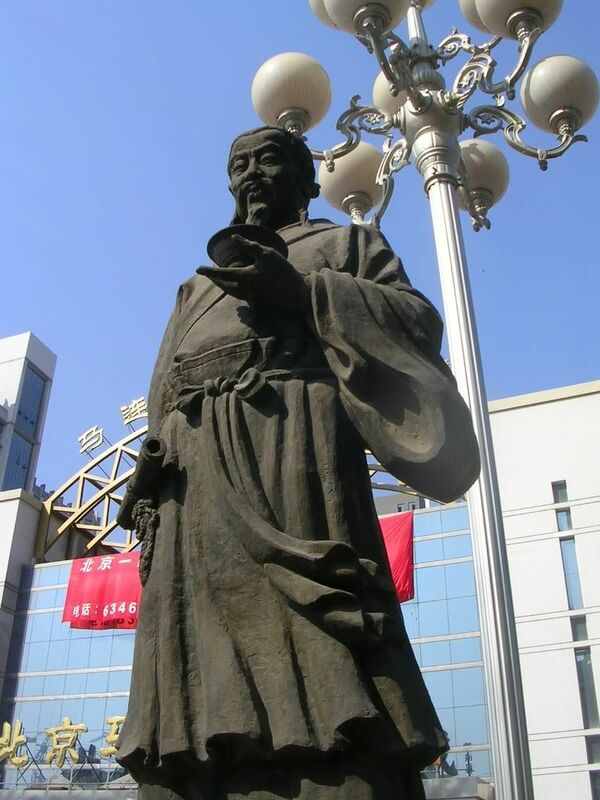 ), but we still managed a surprisingly interesting conversation about Chan Buddhism [Chinese Zen] somehow. Plus, she buys the same brand of sunflower seeds as we do at home! Finally, we found some decent 2007 Jingu "Yangtashan" bing in the Yundun shop (Chayuan B2-9). I grabbed a single bing for now. The nearby shop had a fabulous propaganda poster for its tea advert [pictured] - I really love these posters, either German, Russian, or Chinese (or British, American for that matter). It reminds me of the car-sharing poster, "When you ride alone, you ride with Hitler." Marvellous. The sun was getting low, and my hangover from the previous night's club was still biting, so we called it a day. I think my first (fairly negative) impression of Maliandao has been overturned. It just requires a little persistence, and the fruits are there to be unearthed. I really dislike bargaining, though! I have a confession to make, and it's a bit embarrassing. 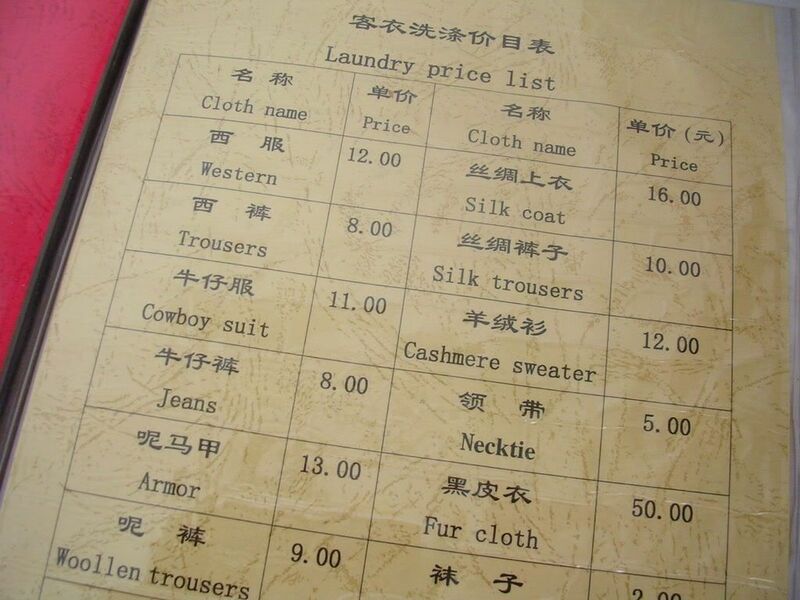 When I travel, I like to wear a cowboy suit. I know, it's weird, but it's true - full Texan style. It's one of my quirks. Also, and I know this sounds a bit odd, but (even if a safe city like Beijing), I sometimes feel safer wearing parts of medieval armour, sometimes just the greaves or breastplate. It just makes me feel less vulnerable in an uncertain world. Unable to avoid the attentions of my previously-described snoring Israeli roommate, I ended up going to see some temples with him. 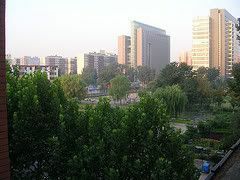 Thankfully, because I had to make some 'phonecalls to arrange to meet some friends here, I eventually had the opportunity to part ways, and he disappeared off in the direction of Tian'anmen Square. This left me outside the Kong Miao (Confucian "Cathedral" temple of sorts) with my freedom regained. Walking up a narrow hutong [traditional old alleyway], I came across a sign on a dark, nondescript building that simply read "Tea Ceremony". Wary of tourist traps, I tentatively entered. The result was a fairly genuine gongfucha experience, with a sincere and unassumingly gentle staff of girls in qipao operating the teapots. I slowly worked my way through some tieguanyun (fairly decent) and some surprisingly decent old shengpu, while I wrote my diary. Just out of shot to the right was a bookcase whose contents look just like one we have at home, even down to the Lin Yutang. I know Lei would love this place, it's hard to enjoy it without her. They had weiqi ["Go"] sets in heavy marble to play with, and (I'm sorry about this) I did manage to score some kudos by placing the classical "guqin" music playing as being that from Guangling (I cheated, because it's a CD Lei and I listen to at home a lot). I was mentally high-fiving myself at this point. Today: a bit more Maliandao. P.s. Israeli roommate ditched for a silent Chinese PhD student. Even better, when I came in last night, even he had packed all his stuff and moved out, leaving me blessedly alone! *Actual facts may deviate from description provided. Greetings. 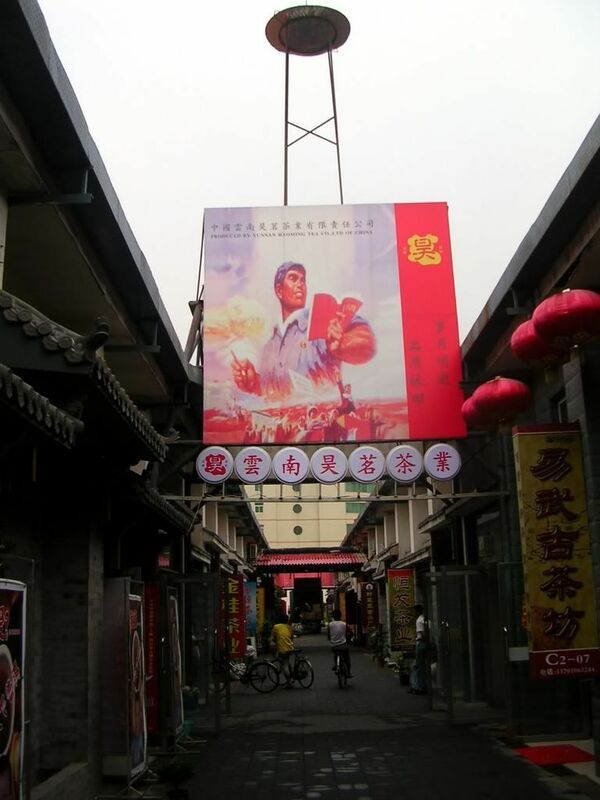 The first thing to note is that posting blog entries from China is very much like operating an ATM: all of the buttons have strange characters on them, and one must rely on a sense of memory to remember the functions of each. Bear with me, and forgive any unusual punctuation that may occur as a result! Do excuse the somewhat chunky rescaling of the photographs, too - I have no hope of getting this PC to create the usual smaller snapshots of each photograph to avoid the aliasing. As ever, do please click on a photograph if you'd like to see the original size. 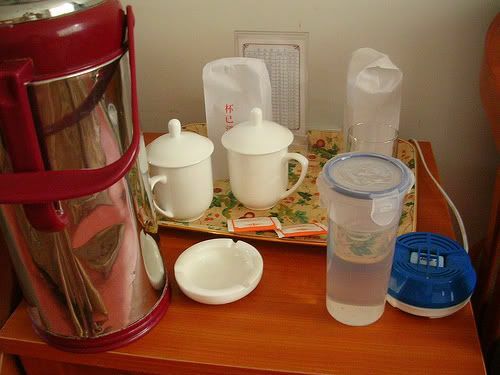 The Chinese predilection for hot water seems to be 50% belief in the fact that warm water is good for the stomach, and 50% down to the fact that unboiled water is undrinkable. It makes for a good start to the day, if you happen to have some old Gaoligongshan knocking around, though. When I entered what turned out to be his shop (and rather tastefully-attired it was too, just out of shot), he was losing at a computer game that I used to play many years ago. He turned out to be fantastic conversation, being very sincere and amusing. Between my poor ability at Chinese, and his decidedly less poor English, we met half-way (or maybe 80-20 in his favour! ), and I spent a good three hours drinking his private teas that he didn't have for sale. 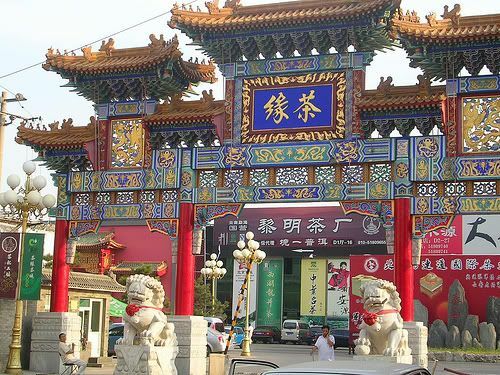 It turns out that his father's brother recently started the "Linbo Mengku" factory, of course in Shuangjiang, in Lincang. Lots of stock on the wall was understandably from them. We eventually got around to them, and they were, at least, somewhat less uninteresting than many of the other cakes I'd tried up until that point. The high point was discovering a truly vast quantity of 2000 Xiaguan Tuocha, which (after lunch together and our long session), he put down at a decidedly low price - I felt rather embarrassed to be talking money with someone that I had come to consider a friend, and it seemed the feeling was mutual. I grabbed a few 5-piece tubes (dark, woody, surprisingly well-aged and pleasant for 7-year tuocha) and resolved to return. I pointed out many of the English-language tea vendor sites to him for his reference. Much eyebrow-waggling ensued. (Xiaomei seated right, her little brother in the host's chair.) We started out with a 1995 shengpu, and moved on to a cake that both she and MarshalN found to be very enjoyable (2005 Yisheng cake from Yiwu leaves). Following her fine recommendations, we soldiered on through a 2006 Douji, and a 2007 Zhuyanhao - not quite up to the Yisheng, but good enough in their way. Some of these left the shop with me after our two-hour session. She was a very generous hostess indeed. It's always sobering to meet a small child whose ability to speak Chinese totally eclipses my own. Finally, I made it to a shop that sold Quanji cakes, one of MarshalN's noted factories from a previous tea-tasting that I'm sure you recall. Two sisters ran the place, and were very friendly, until their big sister returned (who owns the shop) at which point their expressions turned to stone, and it was "all business". The cakes were fairly uninteresting, and exceptionally highly priced! Ending on this flat note, I jumped into the front seat of another taxi, and headed out. I was given a great tip in haggling: don't mention a number until as late as possible. Just don't do it! "Once you say a number, you can only go up", they say. So, let them open with a price. It would be tempting to enter your own at this point, but hold firm, and point out that it's invariably unrealistic, the tea doesn't justify that level, and so on. At some later point, enter with a low price - which, of course, is treated with derision. Go up very slowly! The price comes crashing down to earth. My favourite tactic is to slowly stand, make humming-and-hah'ing noises, and make to leave - often this gets a "zuoba!" [sit down], and a return to the bargaining process at a new plateau of lowness. As Bearsbearsbears wrote a long time ago, if they look happy when you leave - you didn't work hard enough! Me: clearly, this is too high. Me: but seriously, what's your real price? Him: the price is X. Me: we both know the Taobao price is much lower than this. Me: even the Western price is cheaper than this. Me: how about Y + margin? His stubborn refusal to move was made even more agonising by his silken, buttery tones! Argh! Anyway, that's my Maliandao trip. I left the region considerably less excited about it than when I arrived, but having made some decidedly fine acquaintances. Tomorrow - temples, or something. 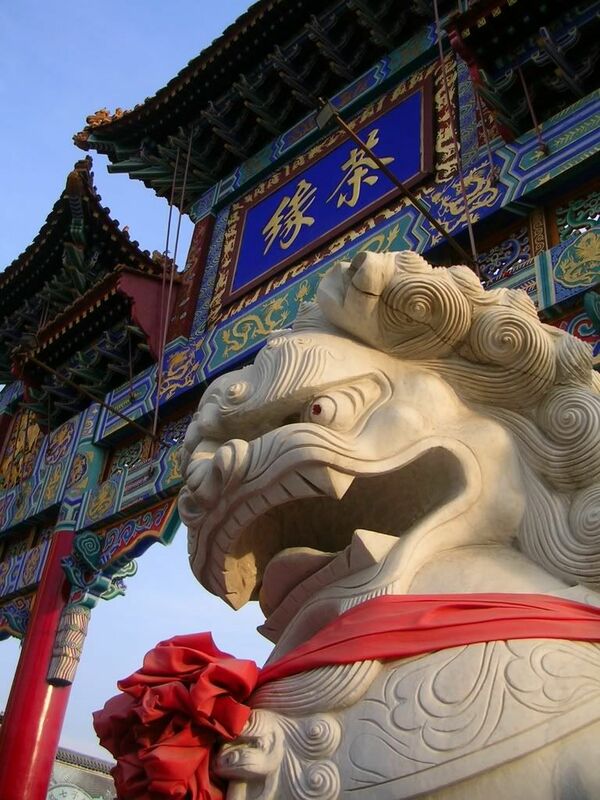 I'm flying out to Beijing tomorrow. I'll post some pertinent tea-related news soon, from the other end, I hope! Thanks again to all those who have been so generous with their good advice. Checking my search terms, I note with some concern that the Half-Dipper is receiving quite a lot of traffic from the Google search term "crusty jugglers". Is this a good sign?! Surely some vital part of the Incredible Machine with which you work is now not functioning correctly? Quite a bit has been written about this tea already. It formed part of a community tasting event last year, with notes from Bearsbearsbears, the Davelcorp Foundation, and Toki at The Mandarin's Tea. They predominantly noted floral aspects, and it seemed to meet with a welcome reception. It was priced at around $10 when it was on sale at Yunnan Sourcing, making it relatively inexpensive. To quote the product page, this claims "pollution-free" status, as "validated by the ATI Company of Fujian" - I'm uncertain how much that means. The leaves are supposedly single-region, from the Lincang area. Small leaves, in small pieces. This looks rather old-fashioned, given the trend for big-leaf cakes of late. It has a lovely, sweet aroma with a hint of tobacco. The soup is light orange, and a touch cloudy. 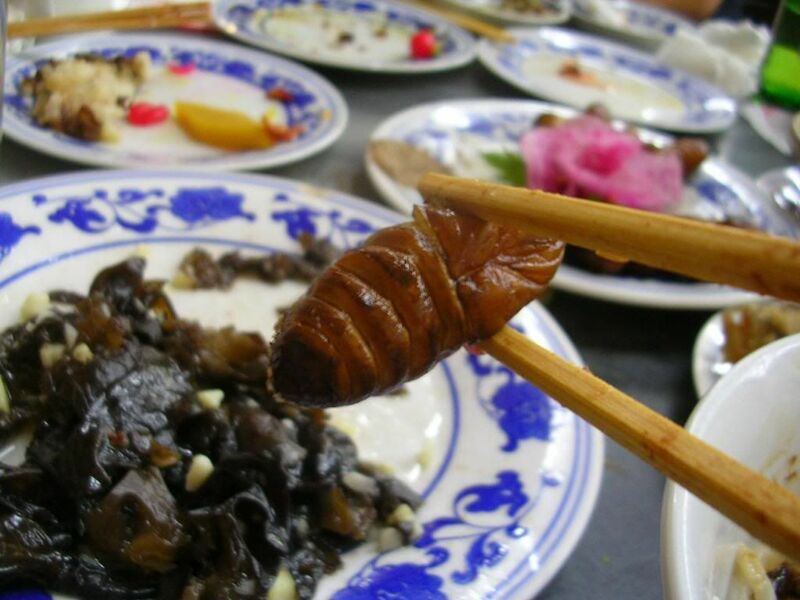 It opens with a grassy, sweet beidixiang, and ends in a brown-sugar lengxiang. The first impression is the fairly smooth texture. The character is quite "low" and pleasant, but it has a slightly acidic ku that keeps it interesting. While the character is reminiscent of flowers, it is more akin to the dark, low nature of chrysanthemums (which Lei likes to brew), rather than the bright floral aspects of some gaoshan wulong. Like CB, I find the chaqi to be quite significant: my neck and arms are flushed with warmth, and tingle noticeably. This tea needs pushing on - it is quite understated, indicating a certain weakness in the leaf - perhaps due to their small, spring size. The aroma departs fairly quickly, after perhaps three infusions, but the gentle chrysanthemum notes continue until the sixth infusion, by which time it has collapsed into basic "tea" flavours. Tiny spring leaves, which account for the requirement to brew heavily, I also find that it lacks a solid, decent base of flavour. 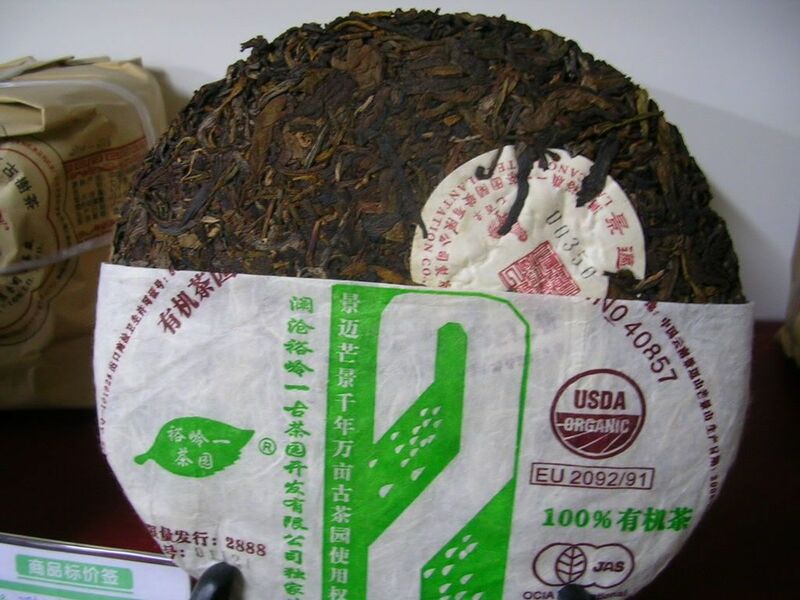 What is present is enjoyable and fresh, and the decent quality of the leaf can be determined from the good texture, and the chaqi. The low price might tempt me into acquiring a few, if I come across them in future. It's a borderline call. I get the feeling that I didn't achieve the best results possible with this leaf - do please share your brewing advice, if you have familiarity with this one. Thanks again to CB for giving me the opportunity to taste this little fellow. I'm not sure that I saved the best until last, this time. With a sense of unavoidable inevitability, here's the final installment of the terrifically titillating Dragon Teahouse tea-tasting triptych. Not as attractive as the other two teas, but large segments of good leaves are apparent, with a scattering of large silver tips. The compression, while not as high as a Xiaguan tuocha, was tight enough to cause some leaf damage during separation. The aroma is very sweet, with a tobacco undercurrent. From the infusions, you will correctly have deduced that "green" happens to be a very good choice of colour for this tea. The rinse was yellow, but the proper infusions turn out orange. As cloudy as the "red" tea, neither reach the clarity of the "blue". The beidixiang is scent-free warmth, but it hands over to a long, powerful lengxiang of brown sugar. Even though the infusion is short, the ku is potent: it attacks the instant soup touches lips, and runs its hot, metallic passage through to the throat, where it swells and promotes significant watering of the mouth. The flavours are somewhat reserved, being limited to the "sweet grain" part of the spectrum, but the texture in the mouth is smooth - perhaps from the tips. 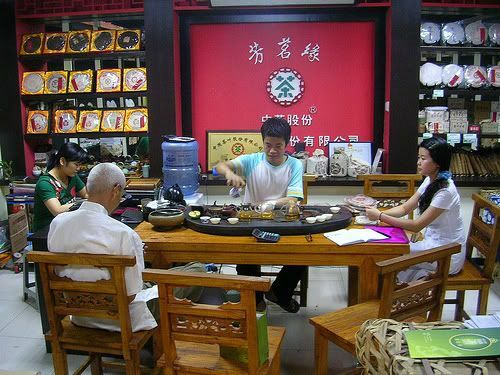 The bare minimum of time for water touching leaves is sufficient for the quantity of leaf I have used, which includes a moment to put down the kettle, and put the hulu [gourd-filter] onto the gongdaobei. The tobacco from the aroma is only really detectable in the after-aroma. Five infusions in, and I wave the flag of surrender - it's too energetic for an evening tea session. Very green, and small from the pick of spring. Mostly fragments, they are not very pretty to contemplate. Bitter, potent, strong! The ku is all-powerful, but it does not conceal a strong flavour, a particularly smooth texture, or advanced chaqi. It's just a whole lot of ku. This isn't really my "cup of tea", preferring the "blue" out of all three - which is much more to my personal preference, if a touch quiet. Over to you. Greener than the "blue" tea, and with larger leaves, there are many tips present. A satisfying grape aroma is intermingled with deeper mushroom scents. The photograph doesn't really do justice to what is a slightly prettier cake than the previous. More yellow in its soup than orange, and quite cloudy in comparison to the "blue", the beidixiang is low and long, leading into a sweet lengxiang of brown sugar. The first impression is the smooth texture, which makes its initial mushroom flavour seem quite viscous. Like the "blue" cake, this is sweet in the finish, but is more dark - the sweetness of honey, in comparison to the previous sugary sweetness. Again, there is a tangy huigan. The whole affair is quite self-contained, not stepping too far in any one direction, but it maintains a gentle, pleasant overall effect. I was expecting my attention to wander, but the refreshing nature of the sweetness kept me fairly well entertained, even if this isn't going to win any prizes for complexity. After five infusions, the tea felt as if it could happily continue, though I stopped. 3cm spring leaves in whole, good condition back up the observations of the dry leaves. Pure green, with no crazy processing, makes for a refreshing change given the modern environment. The appeal of a simple, honey-like tea combined with the decent leaves gives me a fairly favourable impression of this cake. A bit of light fun for the evening - my einekleinenachtmusik. Preparations for a trip to Beijing are underway. If anyone has any keen advice on getting access to Blogspot.com from the Mainland (particularly John), it would be gratefully received! You may have noticed rogue posts appearing and disappearing on the Half-Dipper lately - these are the results of my trying to get the publish-via-email mechanism working. So far, I think I've managed to include small images into textual descriptions, and so it may be possible that I'll be able to contribute to the Half-Dipper from afar. Again, any tips from our roving Blogspot correspondents would be a treat! I understand that samples for the Tasting Event are beginning to arrive at their destinations! This is good news. Mine have recently arrived - thanks, Gordon. The first tea ("blue") is one that I've been meaning to try for quite some time. Do please bear with me, as I know I rather unfairly have the advantage in being aware of the actual teas - I'm looking forward to reading some more opinions, and in some further discussion once all the notes are in, at which point we can discuss the actual factories and cakes by their true name. Pretty leaves, with some tips, which have experienced good handling as evinced by their surface condition. The aroma is particularly sweet. The soup is slightly orange, which actually starts yellow. From the sugary-sweet aroma in the wenxiangbei, I anticipate a similarly sweet flavour. This turns out to be the case: the flavour is instantly fruity, with a citrus backing, a robust sweetness running throughout. The texture of the soup is smooth, perhaps influenced by the tips and general good leaf condition. There is a pleasant acidity woven into the citrus fruits that promotes a gentle huigan. Later infusions continue to become sweeter, and sweeter, and yet sweeter! It is pleasantly tart, if perhaps uninspiring in its total range of flavours: it soldiers on, delivering the citrus fruits well enough, though. Baby spring leaves, about 2cm in length, are seen to be fairly fragmented - there aren't very many whole leaves in here, as pretty as the dry leaves looked. The sweet, gentle nature of this tea is explained by the tiny little leaves. It delivers quite a caffeine punch, being fairly energetic, but the flavours are restricted to the upper half of the spectrum: sweet, fruity, tart. The overall result is pleasant, if not inspiring, and (given that I know the actual price, forgive me here) it seems like decent value - which was my initial suspicion. It's good to have tried this cake, having long been on my radar, and it'll be interesting to see what other opinions are out there. I am aware that one of my failings is being a stickler for detail. For example, I recently reviewed a 20-page submission for a book chapter, on behalf of a friend, and found that the list of grammatical and syntactical errors I had identified ran to 4 pages - 20% of the entire document's length. This is not a great side of my personality, I'm sure, but at least my friend knows what he's letting himself in for when he asks me to review chapters. So, you will forgive it as a failing of character when I point out that the full name of this tea in Pinyin is in fact "2007 Chun Xizihao Dingji Huangshan Gushu Yangxin" [2007 spring Double-Happiness character brand best-grade desolate-mountain ancient-tree nourishing-heart]. Of this mighty list of buzzword-compliant phrases, the wrapper actually calls it "Xizihao Dingji Gushu", so that's what I've termed it in the title. I do apologise for my pedantry. 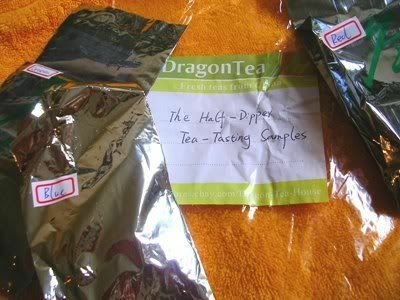 This tea is available from Houde, for $145/bing, where it is sold as "Xi-Zhi Hao Din-Ji 'Yan Shing'". I've been looking forwards to trying this presumably rather special cake for quite some time - for unaged shengpu, it is second only in price to the 2006 Lincang sold by Teamasters for $200/bing. Emotionally stimulating leaves. They are large, exceeding in beauty, and compressed to absolute perfection, coming apart easily, but not too easily. Rich and dark, the hairs on each individual leaf are visible, showing remarkable care in handling and processing. Sweet, rich leaf scents abound. This is quite the masterpiece for visual tea appreciation. The rinse instantly alleviates fear over the processing, when a pure yellow soup is seen. Given the orange quasi-wulong nature of some of the other Xizihao cakes from this year, it's good to see that the showcase cake has got it right. This tea is a multi-stager. The first stage runs from infusions 1-4. The tea is instantly alive on the lips and tongue - funnily enough, just like the 2006 Lincang. It is vibrant, effervescent, and clearly active in some interesting way. It becomes a big mouthful of sour mushrooms in the middle of the palate, and I am grateful to see that the ku has not been processed away. It is an "impatient" tea, sprinting through the mouth to become a pleasing, tongue-aching huigan. One of the fascinating aspects of this tea is how it changes as one watches it. 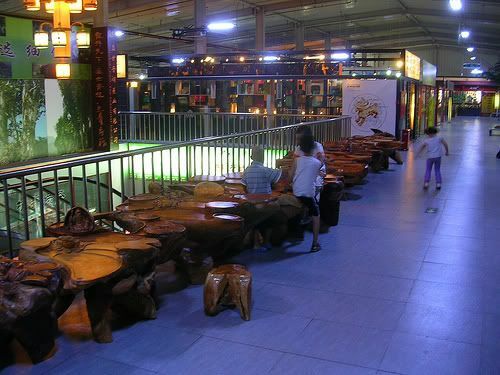 Over the course of perhaps 30-60s, the soup in the gongdaobei changes from lucid yellow to rich orange. I've never seen a tea so very active in the presence of oxygen; it's like watching an apple turn instantly brown in the air. I attempted to document this phenomenon in the accompanying photograph, in which the two (slightly misaligned) central images are taken 45s apart. Commensurate with the highly active sensation of contact in the mouth, there is a bright chaqi that flushes my neck and shoulders. 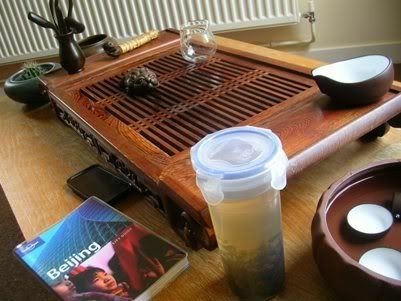 Guang's notes point out a "numbness" at the top of the mouth, and this is clearly evident from the effervescent nature of the tea's contact with the tongue and palate. In fact, Guang's description of the product, in terms of flavour and aroma analysis, is very accurate. That was stage 1. Stage 2 runs from infusions 5-8, and the flavour has collapsed. This must be due to the fact that I let the leaves cool, due to my absence for 20 minutes. On return, it was vapid, uninteresting, and shallow in aroma and flavour, though the active character remained. Stage 3 ran for the last 3 infusions, at which point I went into overbrew-mode to try and reclaim the flavour. This was successful, and I got better results by really pushing the tea on at the end. Healthy spring leaves, kept in excellent condition. Amazingly active, the sheer quality of the leaves is beyond question. It is light. It is a good tea, but it is rarified and refined - like a thin, fine porcelain piece of crockery. It's sheer quality of workmanship is not in question, but it lacks serious substance. This is very much a question of personal taste, but I long for chunky, robust characteristics in my tea - particularly when paying such large amounts - and this tea doesn't really meet those (personal) goals. I used a lot of leaves, hoping to achieve this, and while the result was really very beautiful, it didn't pack the array of eye-opening flavours that I look for. The energy was, like the 2006 Lincang, beyond compare in young shengpu. If money were no object, I would buy several of these for the sheer energy and refinement alone. However, I must weigh expenditure with received pleasure and, for me, there are other cakes that more urgently warrant my capital.